Gawler Body Works has been trading for over 40 years in the automotive repair industry. With a combined workshop experience in excess of 60 years & employing local staff from within the community, we strive to produce the best quality repair for the customer every time. We have the latest in repair equipment and spray paint technology. By implementing the latest in PPG Envirobase Waterborne paint system in 2015; we are keeping up with the same paint standards as new car manufacturers. This effectively means we can duplicate the colour and paint finish of the existing panels with ease & precision. Our staff are up to date with current training techniques, products and therefore provide the best quality repairs for you & our customer. 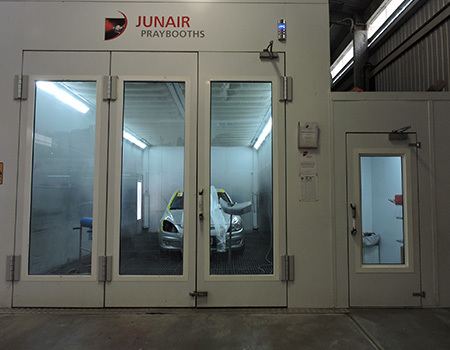 Our Junair spray booth has the latest air drying / air moving quad system which, in conjunction with the Envirobase paint system, enables us to dry all paint twice as fast as other booths. This keeps the cycle time of the vehicle in the workshop to a minimum. The customer will have their vehicle back in the shortest possible time. We understand how inconvenient an accident is so we have our own tilt-tray tow truck on standby 24 hours a day and also offer hire cars if customers require them. Customers will be well looked after with the free wash & vacuum all vehicles receive while in the workshop. Our staff will go out of their way to make sure that the whole process from first point of contact to the vehicles collection is as easy for the customer as possible. Our customers also benefit from our life time warranty on all vehicles repairs by us. This gives them the peace of mind that in the event of a problem with the repair we will do our utmost to rectify the issue at the earliest possible convenience.